The Q8 is based on the same platform as the Q7, but it's more coupe-like proportions means that it is wider, shorter and lower than the Q7. Audi has lifted the veil on its highly anticipated Q8 SUV. Badged Q8 50 TDI, the diesel will drag itself to 62mph in 6.3ec and top out at 144mph, though if you can wait a little longer than Audi will expand the range with a less powerful (and presumably cheaper) diesel option (228bhp, badged 45 TDI) and a 335bhp V6 petrol under the 55 TFSI banner. Sharing much of its running gear with the Q7 (and thus also closely related to Volkswagen Group siblings in the form of the Bentley Bentayga, Lamborghini Urus, Porsche Cayenne and VW Touareg), Audi says its new five-seater flagship crossover "combines the elegance of a four-door luxury coupé with the practical versatility of a large SUV", and adds that it is "tough enough for off-road duty". Audi has not detailed the Q8's powertrain lineup, but the automaker says every model will come standard with a 48-volt mild-hybrid system. During braking, it can recover up to 12 kW of power and feed it back into the battery, enabling long coasting phases with the engine deactivated and a start-stop range that begins at 13.7 miles per hour. All Q8s will also get Audi's quattro all-wheel drive system. When required, it can transfer the majority of the power to the axle with the better traction. The upper 10.1in screen caters for infotainment and navigation. 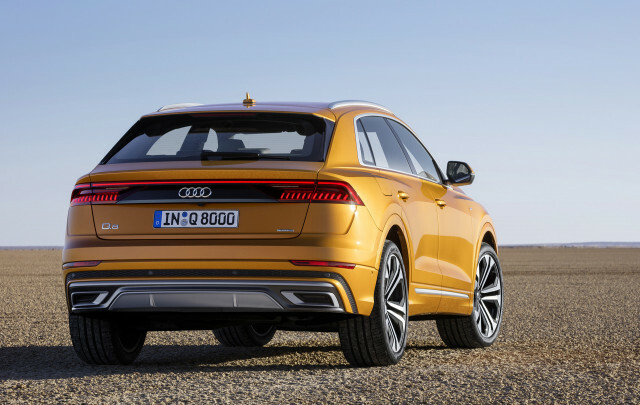 The 2019 Audi Q8 will be offered with a range of driver assistance tech features, like adaptive cruise assist, efficiency assist, crossing assist, lane change warning, curb warning and 360 degree cameras. One cool feature is the remote garage pilot that guides the Q8 into a garage and back out again autonomously. The 2019 Audi Q8 will go on sale in Europe in the third quarter of this year. And it's scheduled to arrive in South Africa towards the end of 2018.